Since I wrote this post, Telmo y Tula, has made some of their videos available only by subscription. You can get a 14 day free by following the link to their YouTube channel and clicking on any video. There are several video that are free. Telmo y Tula is a children’s program co-produced by Motion Pictures, S.A. and Disney España. This Spanish video for kids is excellent for Spanish language learners. 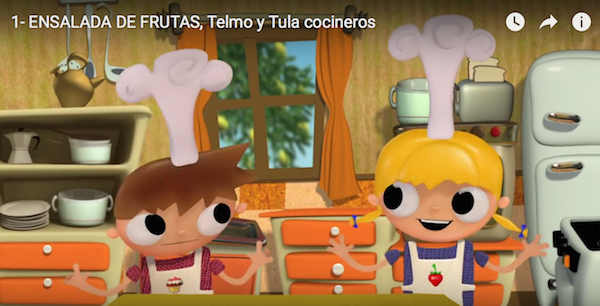 In the cartoon series, Telmo and Tula teach kids to cook (Telmo & Tula Pequeños Cocineros) and do crafts (Telmo & Tula Manualidades). There are lots of Telmo y Tula episodes available to watch on YouTube. You can search Telmo y Tula or use this link to the Telmo y Tula channel. The link is to the Latin American version of the series. To change the version to Spain or choose another language, use the flags. – Telmo and Tula go through the ingredients or materials that you need to make the recipe or craft as the episode starts. That is, they show a picture and say the word – perfect for kids learning Spanish. – At the end of the cooking episodes, they review the ingredients and show the recipe on the screen. If you are not sure of what you hear or what a picture represents, just move ahead to this list. Tip: With Spanish language learners, before you watch, go to the list and pause the video. Read the list together (if you are not sure of your pronunciation, you can do this first on your own and listen to Tula read the list.). This is the key vocabulary kids will hear in the video. It is helpful for them to hear it before watching. – The program moves step by step through the process and at each step the animation supports the language. – There is lots of repetition of the ingredients or materials during each episode. – Each episode is just 7 minutes long. – The characters talk to each other the way brothers and sisters really talk to each other. This is great listening practice and modeling of normal banter in Spanish. Children will not understand every word of the videos, but that is an important part of language learning. Kids learn to listen for main ideas and understand new words from context. – The show is silly in a way kids love. For example, as each cooking episode begins, Telmo announces that they are going to prepare ridiculous dishes (a grand piano in couscous! clocks in green sauce!). Whenever there is step that requires an adult, Telmo and Tula call their adulto. They say, ahora tenemos que llamar a nuestro adulto and then shout ¡adulto! The adult is always engaged in some silly activity, but comes to help. – There is a significant cultural component in the recipes, including the dishes, the ingredients and measuring in grams and milliliters. – These Spanish videos are designed so that kids can make the recipes and crafts. That makes them a particularly effective language learning tool. Ideally, kids would watch once or twice. They would note the ingredients or materials they needed. Then (on another occasion), they would make the dish or craft, pausing the video to do each step. Performing the actions and handling the objects enhances language learning greatly. Parents and teachers should repeat the language in the video as much as possible. – The series is available in a number of different languages, including English. In Spanish, there is a Latin American version and a version for Spain.